The administrative procedure that will determine the fate of whether all of us are able to see the solar system’s two largest asteroids begins day after tomorrow. In what should have been an awesome historic first launch scheduled for this June was put on “administrative hold” last summer for technical issues and cost overruns. The space agency’s Dawn Mission to Vesta and Ceres has been shelved for review – and the big meeting is to be held on Friday. The mission would have taken us all on a nine year voyage out between the orbit of Mars and Saturn into the enigmatic asteroid belt. 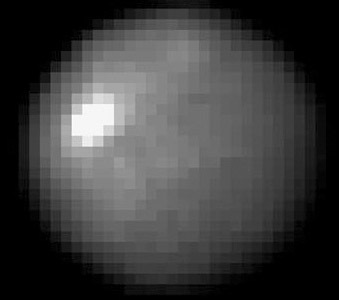 The incredible mission was to have the spacecraft orbit both Ceres and Vesta for months sending back unprecedented images and essential data on the two large mini-planets, themselves larger than most planetary moons. Ceres is nearly a perfectly formed sphere, some 600 miles in diameter. The Hubble photo of Ceres is shown here - the best view we can get over these millions of miles. Vesta is more irregularly shaped – and it is half the size of Ceres at 320 miles in diameter. I have posted a picture page so that you can see some images and comparisons from previous missions and direct views from Hubble. Click here to check it out. Exploring these small planetary bodies is a vital step in the human exploration of the solar system. One day, both Ceres and Vesta will be prime real estate and will occupy essential stop-over outposts between the inner and outer planets. It is way past time that we launched our survey craft out there to take a look and to photograph and map in detail our new territories.